Aww man. I can’t believe this series is over. I’ve been savouring this book for days now, taking my sweet time with it, but all good things must come to an end sooner or later. And I must say, this has become one of my all-time favorite series. It’s just so unique and magical and so beautifully written. And though I wasn’t completely sold at first, I was quickly forced to reconsider because this series really is a piece of art. All the elements that made the previous books in the series stand out for me are still present in this final chapter: the gorgeous and atmospheric writing, the completely real, relatable and lovable characters, the family and friendship dynamics, the subtle but gorgeous romance and the intrigues of the magical realism. Other things I really liked about this finale? More Henry. Gwenllian. Pynch. Blue and Gansey and Noah. The Lynch Brothers. The Magician. The ladies at 300 Fox Way. Pynch. Toga parties. The kissing. Rainstormy kisses and doomed kisses. OMG, Pynch. Basically all of this book was just amazing. 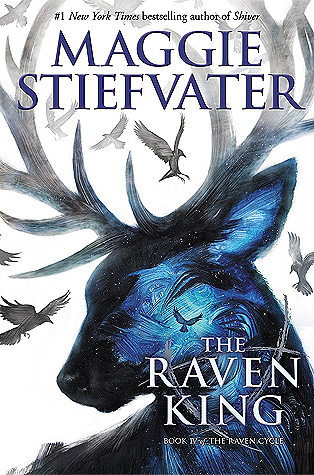 As a finale, I really liked The Raven King. It gave some answers and still left enough open for speculation. That makes it feel like the journey may be over, but more is still out there to discover and I feel like this helps the reader to take this story with them in the future. Not all answers are needed, sometimes it’s nice to just wonder and this finale really captured that feeling. However, I do have one teensy tiny complaint. The ending just felt a little rushed. I know I just said that I don’t need to have all the answers, but I’m talking about the emotional impact here. I felt like the ending lacked some emotional punch. Yes, it made me cry, but I kind of felt like I should have cried harder? If that even makes sense? It just felt like some scenes at the ending were too short and too rushed. HOWEVER, don’t get me wrong. This book and this series is phenomenal! I loved it and I would recommend everyone to read it. Because only for the gorgeous writing and the amazing characters, this is already a masterpiece. Add to that masterpiece the magically intriguing plot, character dynamics and romance and you have one gem of series. Have you read The Raven KIng? What did you think about it? This book destroyed me in the best way ?? and PYNCH ?? I reread that scene a million times. I definitely get what you mean about the ending! I cried a heap, but I remember feeling a little underwhelmed too once I finished it. Overall, I loved it though and I’m so glad you did too!! Those quotes you listed are all so wonderful. I so didn’t want it to end so I just kept reading one chapter at a time and prolonging the end. Maybe that’s also why I felt a bit underwhelmed at the end – maybe if I had read it in one sitting I would have been way more emotionally impacted… I don’t know 🙂 But still, it was so, soo good. And I miss these characters already! Luckily we now have the new Ronan-centric trilogy to look forward to sometime in the future. Also, I so hope we will get more Pynch because they are just the BEST! Haha, I know what you mean! I think I ended up reading it in two sittings. It kind had the same effect though because I was just like so overwhelmed by everything that had previous happened it took a while for everything to sink in because I was just like “wait, what, that’s it?” when I finished it ? I’m so excited about the Ronan trilogy!! I definitely hope there’s more Pynch too.